If we’re judged by the company that we keep, how would the world regard us if all they had to draw on was our collection of exes? That was the premise of Some Girl(s), a 2005 play from playwright/filmmaker Neil LaBute that followed an unnamed man as he ventured across the country to meet up with his old girlfriends, apologizing for the ways in which he wronged them. We didn’t know much about this man—he’s getting married and he’s a writer—so the only tidbits we glean are from his interactions with these women. But are these women, some of whom are still burned from the experience, accurate in their impressions of him? Do they understand him any better than he understands himself? Those questions are also at the heart of a new film adaptation that’s been scripted by LaBute (best known to movie audiences for In the Company of Men and Your Friends & Neighbors) but not directed by him. That job has gone to Daisy von Scherler Mayer, who’s worked mostly in television since directing the mid-1990s Parker Posey indie Party Girl. LaBute’s work (whether on the stage or on screen) has focused on the many ways in which men are horrible, thoughtless beasts. Some Girl(s) is no different, but for a while the film has a looser, less theatrical air about it than some of his other movies. There may not be a lot of depth to this character exercise, but it’s intellectually engaging as well as occasionally emotionally affecting. 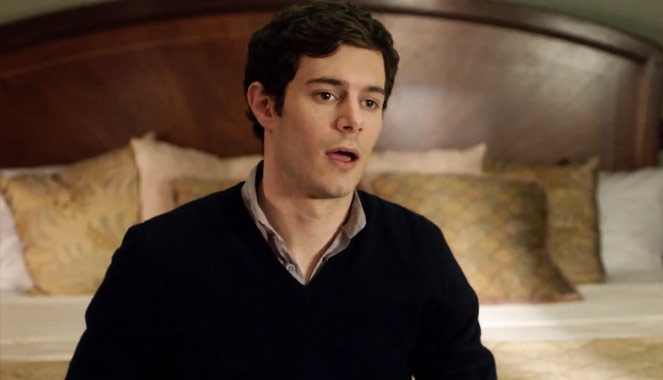 Adam Brody plays the still-unnamed character, who lives in New York City with his fiancée (whom we never see). As the movie opens, he meets the first of his significant exes, Sam (Jennifer Morrison), in a hotel room in Seattle. So begins a pattern that will continue throughout the film: The young man explains to the former girlfriend that he’s getting married and wants to clear the air about any hurt he might have brought upon the woman during their relationship. As its deceptively dismissive title suggests, Some Girl(s) means to be a reckoning for a man with clear commitment issues who hasn’t always considered the feelings of the women he’s dated. But especially in its early stretches, this comedy/drama doesn’t tip its hand about how we should judge this man. (Although, because he has no name, it’s natural to assume that LaBute and von Scherler Mayer mean for him to stand in for the most typical sort of guy, with all the negative connotations that come with it.) That reserved approach makes for an interesting experiment as we try to decipher the entirety of these relationships based on the brief interactions going on in front of us. For instance, was the sultry Tyler from Chicago (Mía Maestro) simply a sexual dynamo? Or was there a deeper connection between them—one that she felt but he rebuffed? As he goes through his series of five encounters, our understanding of him gets increasingly more complicated. When he dated Sam in high school, he was an immature, impatient kid, but by the time he got involved in an affair with an older married woman (a nicely bitter, regretful Emily Watson), he seems to have had a stronger sense of who he wanted to be professionally, if not so much personally. Some of his romantic mistakes were understandably the product of being young and fickle, but others are far more difficult to condone, causing permanent scars to particular exes. The man may hope to right these wrongs, but as he’ll soon realize, some can’t be forgiven away with a hug and an apology—they cut too deep to be healed so easily. With his sweet, handsome, somewhat bland countenance, Brody is an ideal actor for this sort of role. As the character explains at one point, he means well as he goes about this little fact-finding mission, and he seems legitimately upset about the heartache he’s caused these women. But there remains something a little too callow and a little too smug in his demeanor that suggests ulterior motives, which gives each encounter a palpable edginess. Just as we can’t ever be sure if we can trust these women’s impressions of him, we’re not entirely sure about his sincerity, either. He hedges the truth just enough to make us wary, and he’s a touch insistent that seeming contrite should be acceptable to these exes. LaBute’s best work has always been about the power dynamics going on in relationships, and Some Girl(s) is charged with that back-and-forth between the man and these women in these anonymous hotel rooms. The women’s performances vary depending on the strength of the characters they’ve been given, but Watson, Zoe Kazan and Kristen Bell are delectable playing very different lovers who have stirred this man’s imagination and hormones. We may not learn much about their characters, but the actresses are vivid enough to suggest depths within these women, hinting at who they used to be and how they’ve changed since dating this man. Most of us would have a difficult time accurately assessing our own past relationships, and Some Girl(s) draws much of its modest power from the notion that other people’s relationships are even more baffling. It’s a shame, then, that the movie nearly flies off the rails with a third-act twist that’s superficially provocative but mostly distracting. After spending most of its running time letting you fill in the blanks on these characters, Some Girl(s) decides to lay out its verdict in a too-tidy fashion. Hasn’t the rest of the movie argued convincingly that people aren’t nearly so simple to understand?